I know many nonprofits who are sceptical of video marketing. However, video marketing can be a huge asset for your nonprofit. When I pointed out that with the right video marketing strategy, 57% of people who watch a video for a nonprofit go on to make a donation, she reluctantly agreed to give it a try. And once she filmed a video, there was no going back. The next time I saw her, she told me excitedly that her video campaign had been a huge success. She had filmed a video and sent it to her email subscribers for her latest campaign, raising money for a larger building for her organization’s soup kitchen. She showcased volunteers’ hard work and shot footage of how her work helped the community, and in the end, she raised $500 more than her target. Because of the power that Jen and other marketing coordinators have seen with nonprofit video, I wanted to create a guide that could help everyone reading it to succeed. 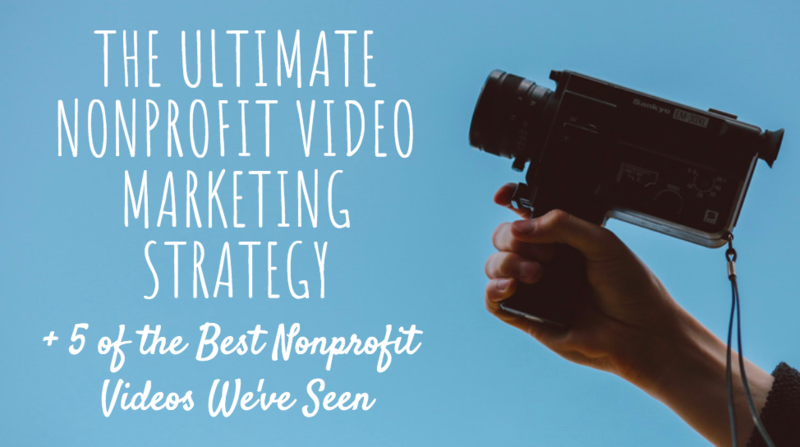 So, in this post, I’ve done the legwork to highlight a few common misconceptions around using video, and dive deeper into what video marketing can look like for your nonprofit. At the end, I’ve listed out five nonprofit videos that I think are particularly effective — and exactly how you can see the same kind of success. Just like Jen, you might be wondering if making videos is right for your organization — or maybe other members of your nonprofit aren’t convinced yet. If so, I’ve put together a list of four common objections, and how you can easily overcome them. Many nonprofits think they need high-quality (read: expensive) equipment to make a video, but that’s no longer the case. Almost everyone has a mobile phone these days… meaning that almost anyone can make a video. You can effectively tell your nonprofit’s story without all these aforementioned bells and whistles. A simple video testimonial, needing only someone to tell their story and a camera, is often enough to make your point — so don’t worry about being flashy. Although you might be worried that your hard work in creating a video will go to waste, your audience is probably more interested in checking out a quick video than they are in other content. In fact, the average user spends 88% more time on a website with video options — showing that your audience will stick around and look at more of your content if you have videos at the ready. Plus, by 2020, 80% of Internet traffic will be due to videos, meaning you’re likely to see a boost in engagement because the rate at which people are consuming video is growing more than any other kind of content. The idea of scripting, practicing, and then finally filming a video might seem daunting. But it doesn’t need to be that complicated. In fact, at Wild Apricot, we make a lot of videos ourselves. This one about social media fails took my coworker a day to make, from scripting to editing — not bad when you consider it now has over 10,000 views on Facebook. This timespan can even be shortened for Live videos, which also happen to be some of the most-watched on Facebook. To get started with nonprofit video, all you need is your smartphone and some willing participants (or a cool event of which you can take a quick recording). Although some organizations might be worried that spending time creating video isn’t worth it if it’s only going to be used for one particular campaign, that’s actually not the case. If you create a great video, it’s easy to share it over and over on social media, as well as through your email list and blog posts. The reverse can also be true. For example, if you had a blog post that performed particularly well, you can transform it into a video to reach a different audience. You could also turn some of the FAQs you receive about your nonprofit into videos rather than a text post. Videos on social media are also getting more and more popular, generating 1200% more shares than text and images combined. Plus, platforms like YouTube or Vimeo have built-in communities, meaning that you can reach out to a variety of potential donors who might not have heard of your mission before as well as hosting them on your website. Now that you’ve convinced everyone in your organization that video marketing is right for you, it’s time to start developing a video strategy. To get you started, I’ve listed the four main steps that you can follow when creating your video marketing strategy below. How many times have you tried to launch something new at your nonprofit that’s failed even before it got off the ground? Something that I’ve seen happen at other nonprofits is, no matter how great their ideas were, their video marketing strategy never really happened because they didn’t have a good idea of their video goals. That’s why, before whipping out your camera, you should ask yourself: what am I hoping to achieve with this video? This one simple question will inform the rest of your strategy, and will ensure you’re not wasting your precious time creating videos that won’t get you anything. How many videos do I want to make? Who is going to help me make videos? Writing down these answers and keeping them top of mind will help you stay focused on the kind of content you’re going to create (and ensures you won’t get in over your head). Once you’ve decided what you want to achieve with your videos, the next step is to pick the topics that will help you accomplish these goals and the order in which you’ll create them. Live video: You can create a streaming video feed through a platform like Facebook Live or Periscope in order to share live updates like an on-the-spot interview, what’s happening at a live event, and much more. This kind of video is perfect for when you have an event happening, or for when you just want to give a quick update. Email video: Are your email open and click-through rates lagging? Using the word “video” in an email subject line can boost open rates by 19%. Adding a video to the body of an email can help your message really resonate with your donors or supporters. Use this kind of video if you want your supporters to be able to send it quickly to other people, or if you already have an email campaign in place that needs a boost. Temporary videos: Nonprofits can send quick videos that disappear after 24 hours, which creates a sense of urgency with your followers. Use social media marketing platforms like Instagram and Snapchat to take advantage of this video format. It’s best for the times when you want to show live events, or if a large part of your audience is on social media. Any or all of these kinds of videos can be incorporated into your strategy, depending on your goal for each video and the topic you’re hoping to cover. Think back to the last video you watched. Chances are it included some kind of emotional content, whether it was intended to shock, make you laugh, or make you cry. Due to its visual nature, video is particularly great at eliciting emotions from its audience. That’s what keeps people watching. Just like in this video, if you combine your video marketing with great storytelling, it’s possible to share your nonprofit’s mission with supporters and pull at their heartstrings at the same time. To follow this principle in your own videos, ask yourself: what emotion are you hoping to convey through your video? No matter the topic you’ve chosen, make sure you’re focusing on some kind of emotional appeal to keep your viewers interested. Now that you know what kind of nonprofit video you want to make, how can you make sure it’s the best of its kind? Tracking whichever metrics are most important to you is key to knowing which ones your audience likes best so that you can continue making them. Now that you’ve had the chance to review the first steps of a video marketing plan, here are a few examples to get you started. Like I’ve covered above, there are a few different types of videos that nonprofits commonly create as part of their marketing campaigns. To inspire you, I’ve included one of each type so that you can see which type of video would best suit your organization’s goals right now. I’ve also included a key takeaway for each video to show you how to apply it to your video campaigns. Key takeaway: In two-and-a-half minutes, this nonprofit explains its purpose and introduces its founder. Keep this kind of video short and sweet to ensure your audience learns the key points about your organization even if they don’t have much time. Making more people aware of your nonprofit’s cause is another common use for video marketing. In just a few minutes, nonprofits can put a face on their cause and garner support from current and potential donors. Key takeaway: Spreading awareness for your cause can be just as valuable as a straightforward fundraising ask. Creating this kind of easily shareable and digestible video is the first step to getting new donors and members for your cause. Key takeaway: Note the strong call to action (CTA), aptly titled “Follow the Frog.” When creating videos to inspire specific action from the viewer, ensure your video also has a strong CTA so that your viewers know exactly what you want them to do. Do you ever feel like it’s hard to celebrate your nonprofit’s victories? Even if you’re still trying to raise support for other causes, it can be motivating to publicize what’s gone right for a change. For example, you can use videos to show how donor money is used, show off the success of campaigns, and demonstrate the progress they’re making for their specific cause. Key takeaway: This kind of video reassures your supporters that you’re working hard to make a difference — and that their support helps you accomplish these goals. Remaining transparent about what you’re getting done makes donors feel like they’re part of something bigger and makes them more likely to donate again. Videos don’t need to portray straightforward facts. Your videos can make a point in a surprising way to capture the attention of supporters or donors. One excellent example of this is the SOS Children’s Village video campaign titled “Would You Give Your Jacket to Johannes” to draw attention to the war-torn conditions for children in Syria. The video grabs the viewer’s attention with a heart-wrenching image of a child out in the cold without a coat. Raising awareness of their cause helped put a face on the issue — and it helped the video go viral, helping spread the word about the cause. Key takeaway: This phenomenon is called the identifiable victim effect, and it’s been proven that people are more likely to help out when they can put a face on suffering rather than associating it with a vague group. When creating your video, think about how you can use a concrete example of the population you’re helping to cement them in your audience’s mind. And there you have it: the basics of nonprofit video marketing and how it can help you promote your nonprofit. I hope this guide has inspired you to create a video campaign to support an upcoming fundraiser, event, or cause.